Well, bless your heart, you’ve stumbled upon the internet home of Rev. Jennifer Sowell Glover. Welcome! This is the place where I ruminate a bit on God, share my thoughts on ministry, and celebrate my life and family. And dream a dream or two, as well. You can read my latest blog posts here. There cannot be God-talk without grits! 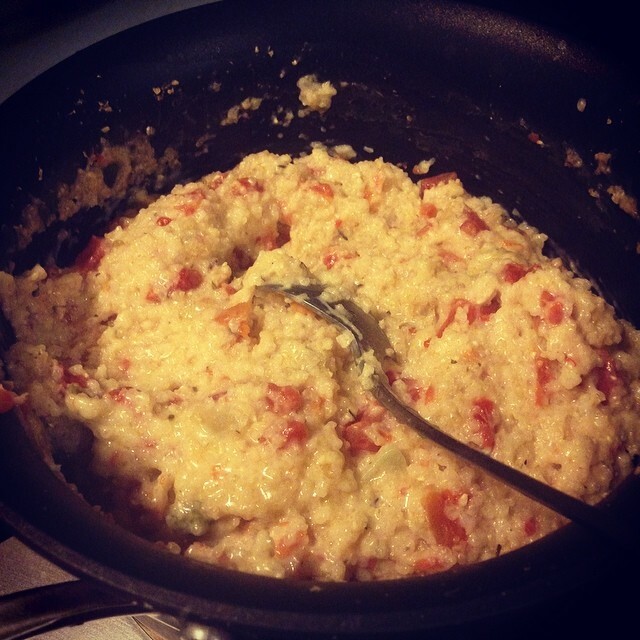 These are spicy pepper cheese grits that accompanied VooDoo Salmon and succotash on Valentine’s Day 2014. If you were in my actual house, like any good Southerner, I would apologize profusely for “the mess” (and unlike most Southerners, in my house there is an ACTUAL mess! ), insist you sit in the most comfortable chair, and offer you something to drink or eat. Since we are on the ‘net, I’ll just say a quick prayer of thanks that you can see my site without seeing my laundry pile! Now, you may be asking yourself why on earth this blog is entitled “Grits and God-talk.” It’s a good question. It’s a title I’ve been tossing around in my head for about ten years now, and reflects where I’ve been and who I am. Grits, as you might know, are a quintessential Southern food. And while I’ve never been a huge fan of that “other” quintessential Southern food (sweet tea), I do love grits. Good, fluffy, buttery grits. One side of my Southern family loves them with sugar and butter, and that was my favorite for a long time. The other side always preferred salt, pepper and butter– and when I met my husband and he suggested I add a little hot sauce, I was sold. On him and the grits. What you might not know about grits is that good ones can be hard to find. Fluffy grits. Often outside of the South, they are watery and overly gritty. No good. As much as I loved New York City, and as much as I love the area of Maryland where I currently live, both places could use some lessons in cooking grits! Good grits are hard to find. And so is good God-talk. Honest God-talk. God-talk that allows you to be yourself, have joy and great faith, wrestle with doubt and grief and hesitation. God-talk that welcomes everyone and allows for differences. And that is what I hope this blog will be. A warm, welcome, and satisfying experience, like a bowl of grits made your favorite way. A place where I can be myself, and you can be yourself. And we can all celebrate that we are God’s beloved children, and that our differences are the thing that makes God so awesome– not the things to tear us apart! Glad you pointed me here. Congratulations!!! This is awesome and the concept is fresh and innovative! Looking forward to meeting you at Pilgrim Church. Thanks so much, Fred! I’m looking forward to meeting all of you as well! I like this idea! I thought all grits were hard and clumpy (if that is a word) and I welcome honest, open discussions about our concepts of God.